When my blog was only a few days old I made a tutorial for a sweet fabric heart charm. I was all into pink at that time! 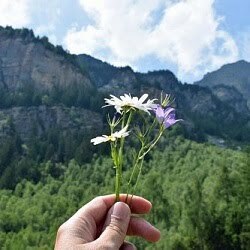 Now, three years later, I revisited this post after I noticed it got pinned to pinterest. I thought it was charming, but the photo editing needed a bit of an update. So I dug up the old original photos, edited them and updated the original post. Then I got enthusiastic about this sweet charm. It is only small, you need just a little piece of fabric. This time I used denim from an old jeans. 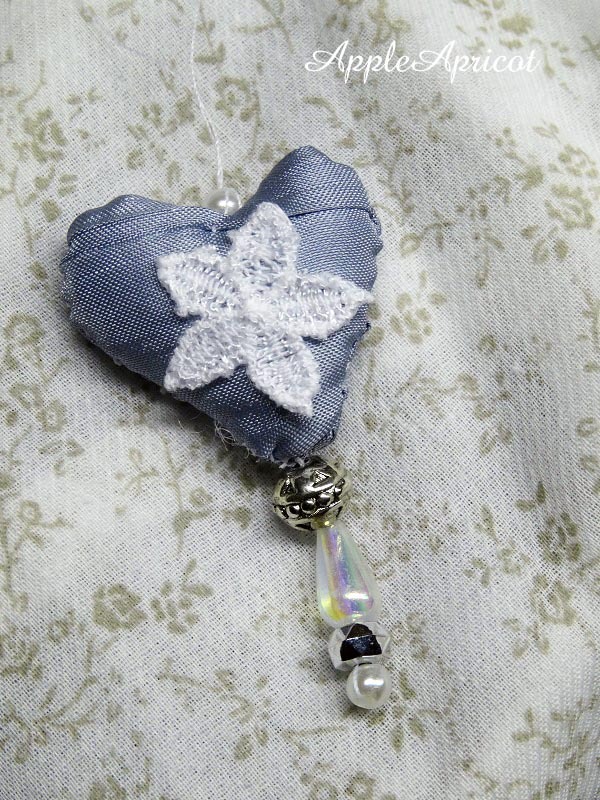 I found it to be harder working with this than with the cotton fabric of the first charm. 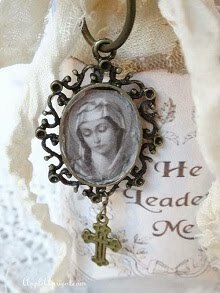 The beads came from necklaces that were beyond repair. Repurposing can be so satisfying. 1) Cut two identical hearts from any fabric you like. 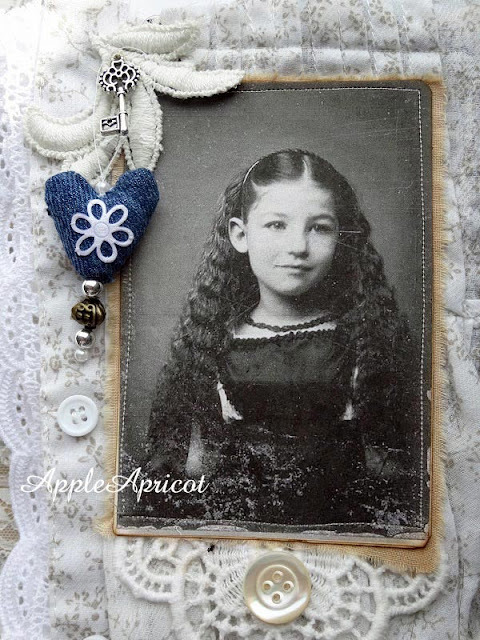 2) Stitch your embellishment like lace or applique on both front sides. 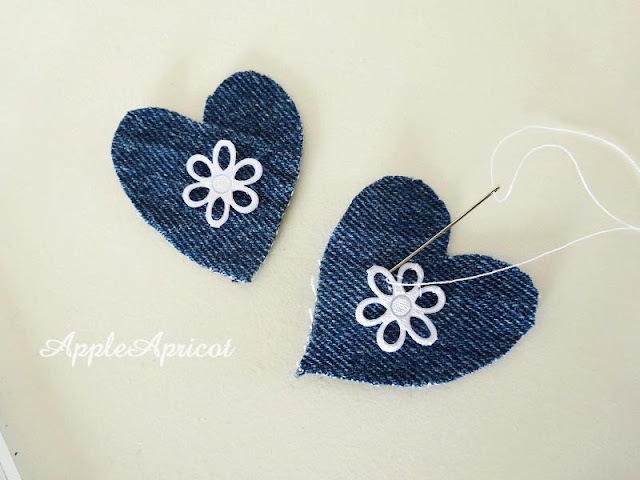 I used these flower appliques. 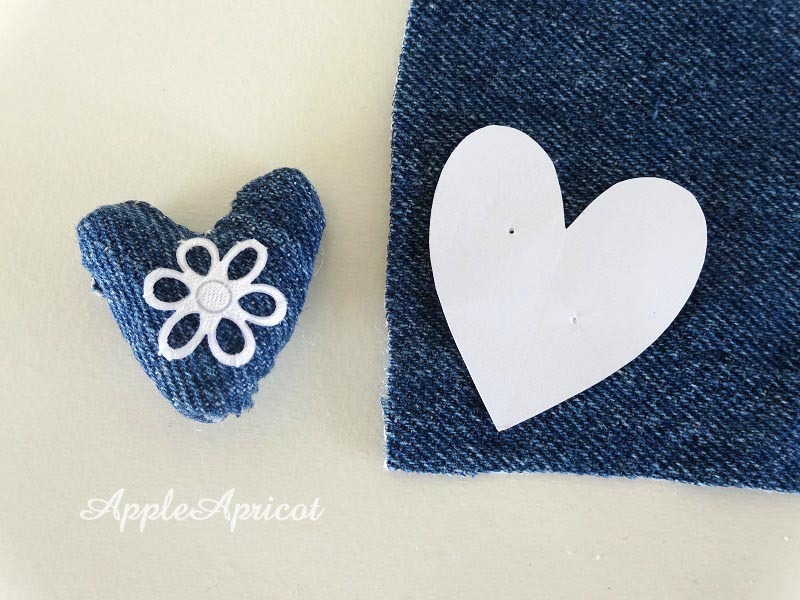 Make sure to leave plenty of room around appliques. 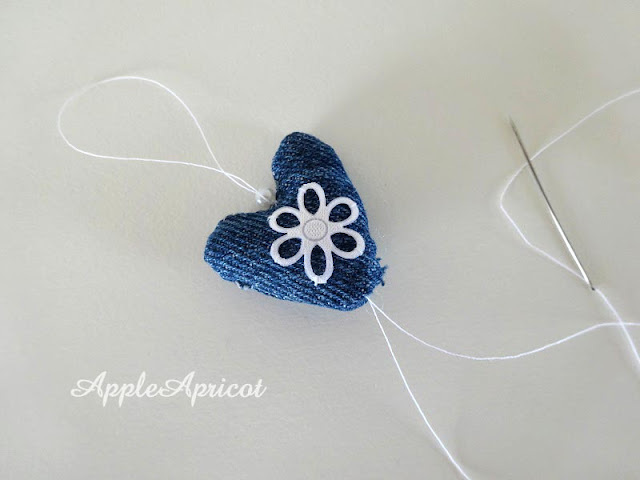 3) Stitch the two parts together - PRETTY SIDES FACING EACH OTHER. Trust me, you'll forget this only once. 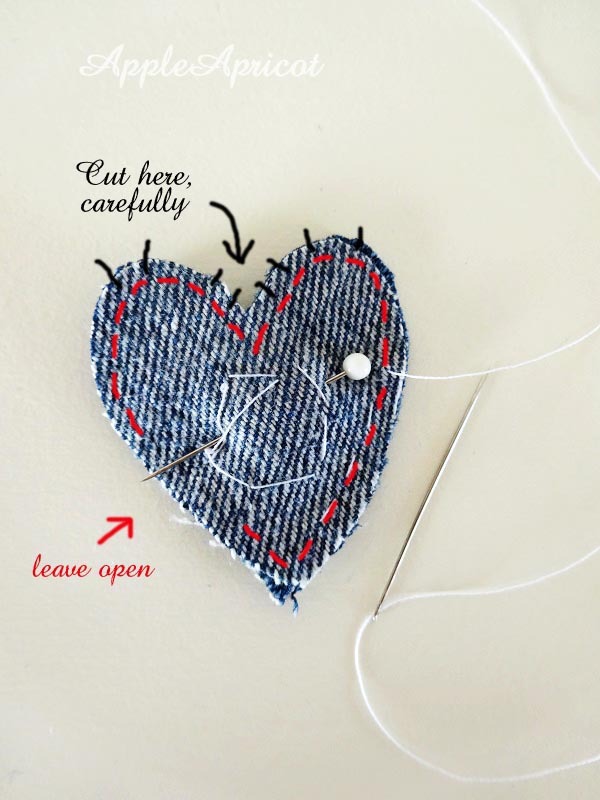 Leave some space between the edge of the fabric and the stitching. And leave a gap on one of the edges like below. Knot and cut your thread. Then carefully cut in the seam allowance like the black lines below show. BE SURE NOT TO CUT TOO CLOSE TO YOUR THREAD!!! 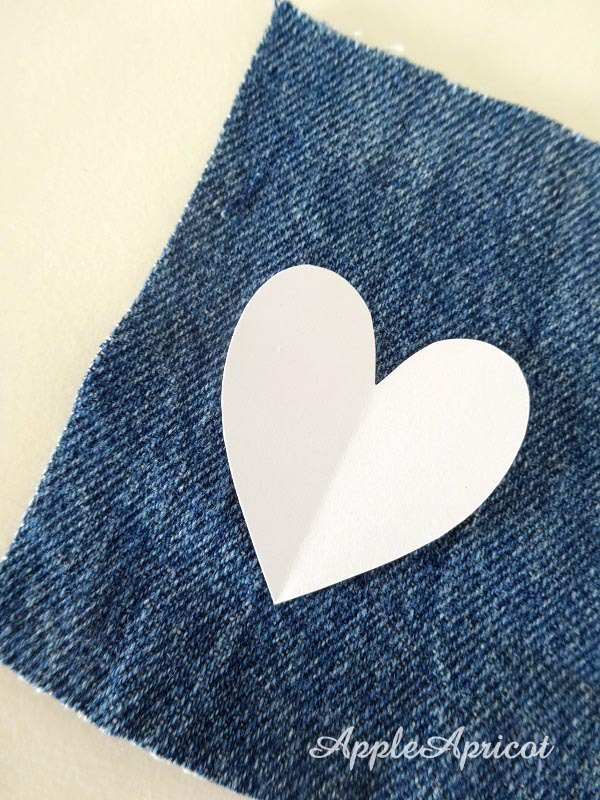 You need this for your heart to shape more smooth later on. 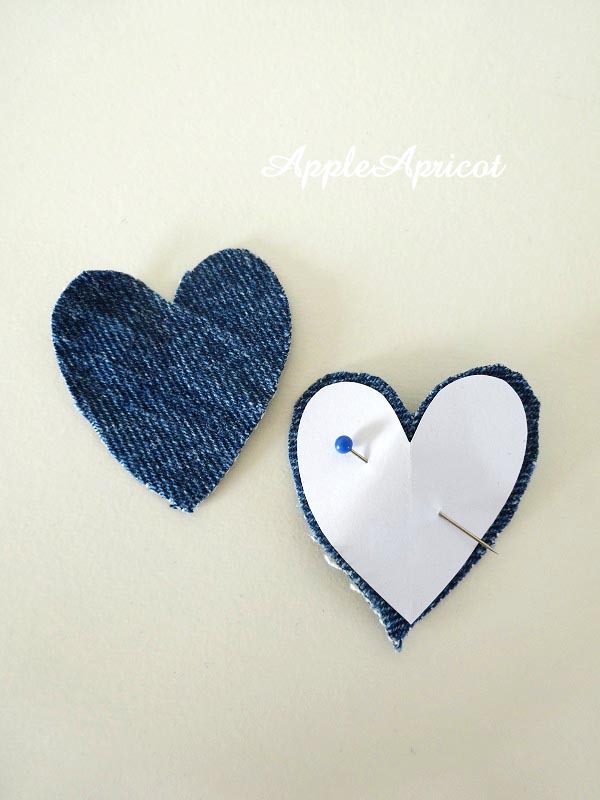 4) Turn your heart shape inside out. So the pretty sides are on the outside now. Use a cotton stick if you need some help in the corners. 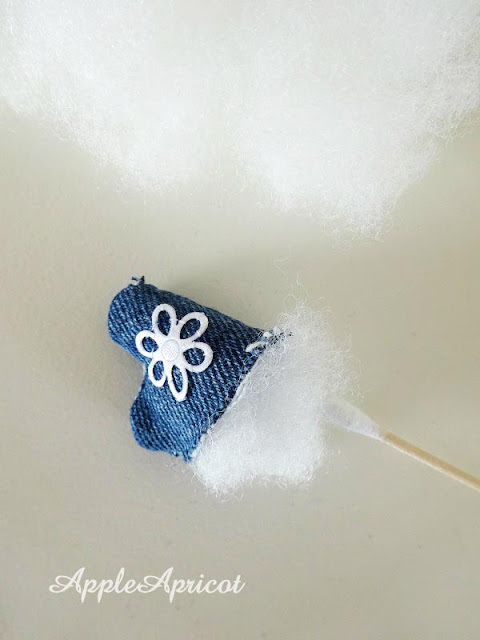 5) Fill your little heart with cotton wool or other filling. Again use the cotton stick if you need help pushing it in the corners. I tried making this stitching clear by adding the red lines here, lol. Begin on the inside of one of the sides, a few millimeters from the edge of the fabric. Ggo to the other fabric side, go from outside to inside. Then on that same side go a bit further up to the outside again. Then back to the other side in the same manner. 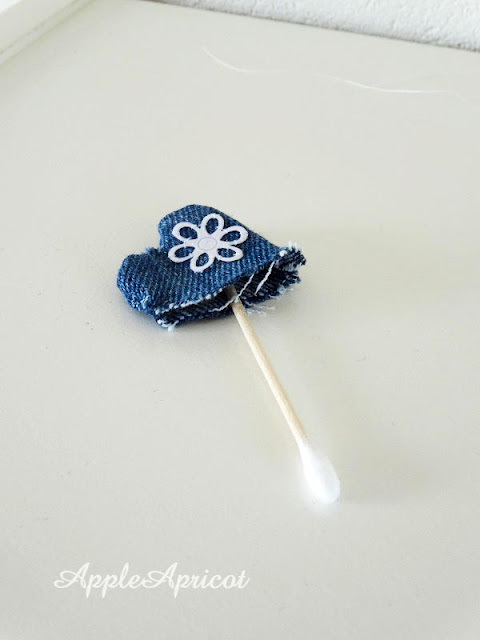 because of the fraying of the fabric. To make it a little more sturdy. because of the seam allowance you have to use. As you can see I used just plain sewing thread. and haven't yet decided on where it will come. You could use something else though, like a thin ribbon. Go in at the bottom with your needle. 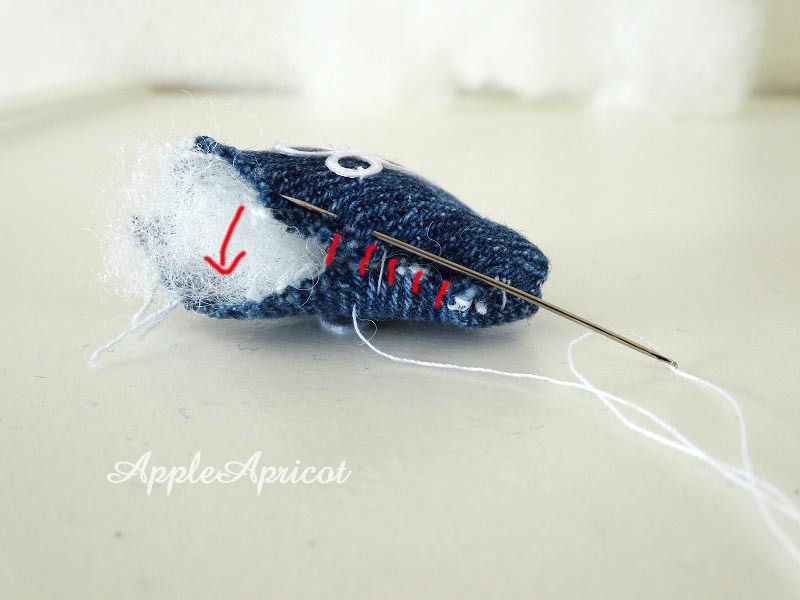 Come out on the top, leaving a few centimeters of thread or ribbon sticking out of the bottom. 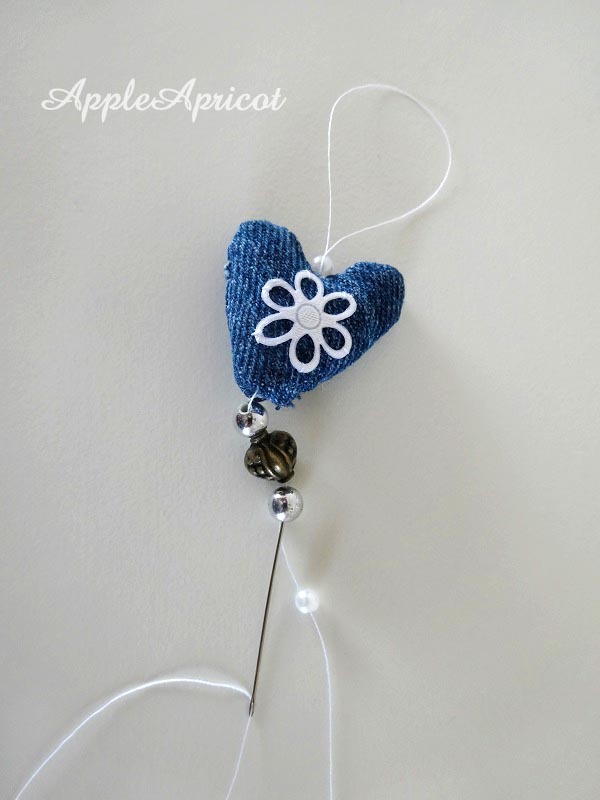 Add a small bead by going with your needle and thread through it. Go round one time through this bead to secure (otherwise it will fall off). I added a knot here to secure it even further. Make a loop at the top of your heart. Go back in with your needle and thread and come out at the bottom. 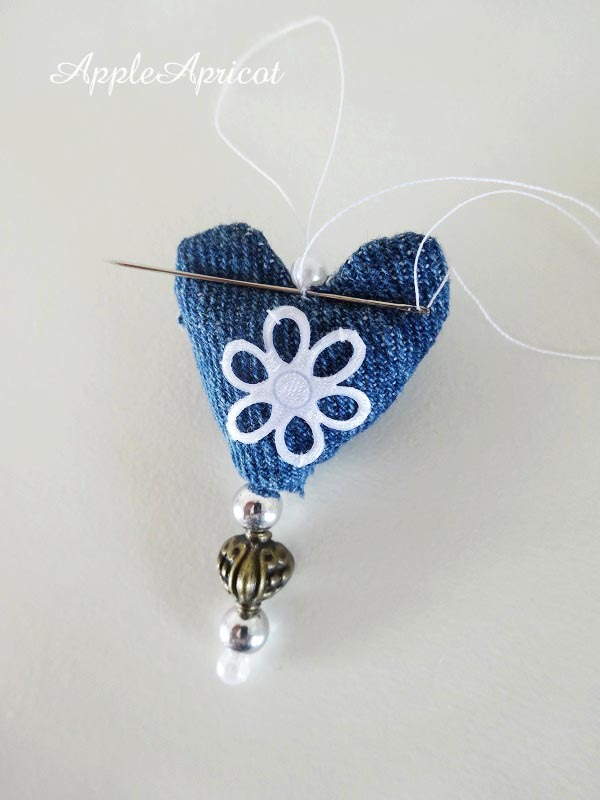 Pull on both ends of the thread (or ribbon) to get the bead tight to the top of your heart. but bigger than the hole of the bead you added before that. go back in to the other beads. 9) Go back in to the bottom of your heart and come back up on the top. Secure the thread by making a knot on the top of your thread, under the small bead there. As you can see I made a tiny stitch there. I then pulled my thread through, but not all the way. There will be a small loop there if you haven't pulled the thread totally through. I got my needle through that tiny loop and then pulled through completely. Now you have a small knot there. I do this a second time to make sure it's really secure. 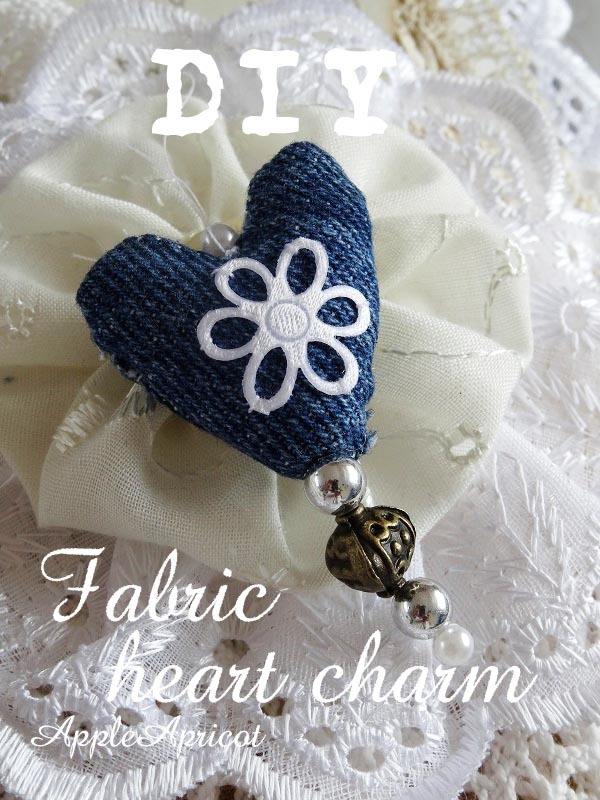 Et voila, my little denim heart charm. Ohhh, I just love denim with lace! For sure it will be added to my fabric journal that is still a work in progress. 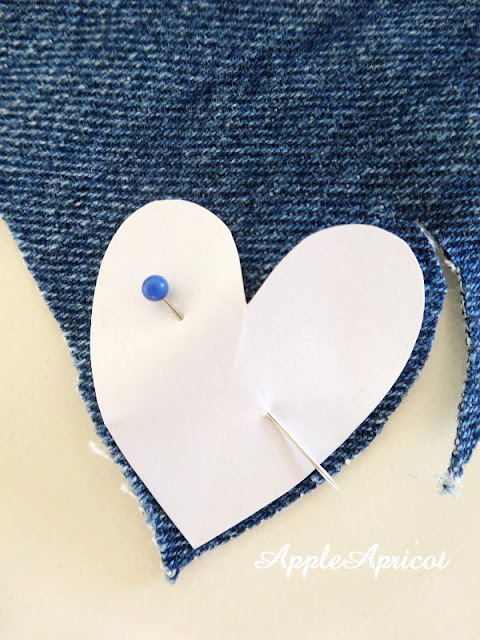 Be sure to check out my Pinterest board Fabric Tutorials and Tips! Many sweet crafting moments to you! So cute, and so pretty! My hat goes off to you my friend - working with denim in a format that small isn't for the faint of heart (hah - I made a pun). Oh my these are so sweet, love how tiny they are, I imagine that makes it harder to sew, love the added beads to it! 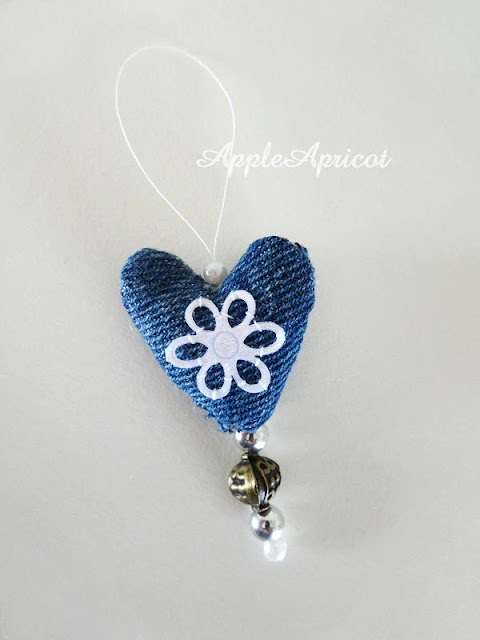 I love hearts! 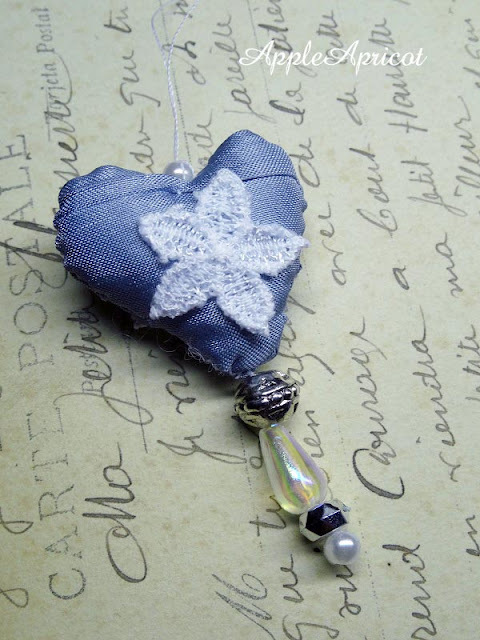 and use them often in my crafting- These beautiful fabric heart charms are nice reminder to keep creating what I love!